The ultimate Halloween night demands a suitably spooky soundtrack and, as the night’s popularity has grown and grown, the canon of songs has increased accordingly. So put these terrifying tunes (don’t worry, we don’t mean Nickelback songs) on the stereo, get practicing those ‘Thriller’ dance moves and enjoy a fright night like no other. Yes, let’s start with the best. An incredible video, an incredible song, Vincent Price’s legendary outro. And it was written by Rod Temperton, a songwriter from Cleepthorpes who you’ve probably never heard of, but whose bank balance surged every Halloween until he passed away in 2016. Raise a glass to him this, and every, Halloween. And we’ll continue with the second best. Precisely one second in you know what’s coming, and when those toms kick into the riff, you’re ready for four minutes of seriously funky Ghostbusting. Of course, good old Ray almost certainly (allegedly) stole this from Huey Lewis & The News but, hey, it turned out well, didn’t it? Mike Oldfield’s instrumental was probably considered quite a nice little song until The Exorcist came along and used it, instantly transforming it into an eerie Halloween classic. Possibly more scary is that it launched the career of Richard Branson, as its parent album, the first release on Virgin Records, sold by the bucketload. An all-time rock classic, this features the extensive use of cowbell - a late percussive addition suggested by producer David Lucas after the track was thought finished. Such is its ubiquity that it provided the finale for the Chad Smith vs Will Ferrell drum-off seen on The Tonight Show with Jimmy Fallon. Originally composed by Danny Elfman for The Nightmare Before Christmas, it was almost built for a Marilyn Manson cover version and he duly obliged for the 2006 special edition release of the film’s soundtrack. 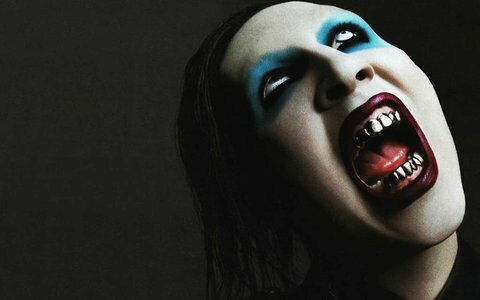 If you see any kids trick and treating, be sure to dress up like Manson and answer the door to them. They’ll like that. Few things in life are better than a slow, Mutt Lange-produced AC/DC riffing classic - and this is one of them. One of the last songs recorded by frontman Bon Scott before his untimely death, the song was actually about the band’s gruelling touring schedule rather than any Satan-related activity. This doesn’t stop the massive light-up devil horns going crazy when they play it live though. Originally recorded a year before by Zodiac Mindwarp and the Love Reaction, Cooper’s version was, of course, featured on Wayne’s World to excellent effect. The track also features an impressive line up of musicians, with Mötley Crüe’s Nikki Sixx on bass and twin guitar virtuosos Joe Satriani and Steve Vai on guitar duty. The Monster Mash has been a Halloween classic ever since it came out as a 1962 novelty song, but it’s always had the slight problem of not actually being that scary. While the Misfits’ 1999 version doesn’t quite achieve it either, it does add some excellently awesome punk power and attitude, thus getting our vote. Inspired by the Stephen King novel of the same name, The Ramones’ 1989 track became a live staple for many years. A live cover by German metallers Rammstein is also well worth a listen (and if you want a true Halloween scare, give this a watch). The last song recorded by the original seven member line up of The Specials, this has a suitably spooky intro, before kicking into the song proper. Nothing short of one of the most instantly recognisable songs ever written, it topped the charts for three weeks and became famous for addressing the dark urban times it was written in. The show was huge, and the theme tune was amazing, but it was still a surprise when an actual song version of it reached number 2 in the UK charts and number 1 in France in 1996. It still sounds creepy and strange now; one of the all-time iconic theme tunes - and it received the ultimate seal of approval from someone who knows about these things, when Mike Oldfield mixed it in with ‘Tubular Bells’, creating the ultimate Halloween mashup. Way before Twilight was around, Warren Zevon was getting down with the werewolves, on this howlin’ classic. Like Alice Cooper, this had some rock royalty guesting on it - Mick Fleetwood and John McVie of Fleetwood Mac performed drums and bass duties respectively. Originally written for A Nightmare on Elm Street 4: The Dream Master, the song wasn’t used, but made its way onto Jazzy Jeff & The Fresh Prince’s 1988 album, He’s the DJ, I’m the Rapper with a video that led to New Line Cinema suing for copyright infringement. It’s no ‘Boom Shake The Room’, but it’s good enough to make the list. 1983/84 was a serious couple of years for Michael Jackson and Halloween songs. He lent backing vocals (along with brother Jermaine) to this track by his childhood friend Rockwell (aka the son of Motown founder Berry Gordy), which hit number 2 in the US and number 6 in the UK. A new addition to the Halloween canon, this six minute epic from Kanye West was the high point of his My Beautiful Dark Twisted Fantasy Opus and featured an all-star guest list, including Jay Z, Rick Ross and, for some reason, Bon Iver. The highlight though, was a truly electrifying guest verse from Nicki Minaj. Not often Kanye West is upstaged on one of his own songs, but this was one such occasion. A 2005 charity single released in Canada, this features members of Arcade Fire, Sonic Youth and Sum 41 as well as Beck and Buck 65, amongst others. The song apparently stemmed “from a frustration with other benefit songs’ misguided, somewhat patronising attitude, and Western-centric worldview” - but either way, it’s brilliantly strange and spooky. Even if this hadn’t been used on the soundtrack to one of the scariest horror movies ever made, it would have been downright sinister on its own. Pro tip: play this quietly while sneaking up on your flatmate in the shower. They’ll definitely see the funny side of it. Taken from 2005’s Angel of Retribution, the first album since 1990’s Painkiller to feature Rob Halford on vocals, the song is seemingly an autobiographical story of the band, including their early rehearsals at the Church of Holy Joseph in Walsall. This probably wasn’t the sort of music the Church imagined they’d help create, but why should the devil get to hear all the best tunes? A bit of a left-field choice, but it’s one of the Furry’s greatest moments, and it’s called ‘Demons’, so in it goes. Also, werewolves are kind of super furry animals, so - again - it definitely counts. The life story of Lucifer, as sung by Mick Jagger, it doesn’t get too much more Halloween than that. It’s also responsible for a gory act: a cover of the song by Guns N’ Roses effectively broke the band up. It was recorded without the input of rhythm guitarist Gilby Clarke, who was a huge Stones fan, while incoming guitarist Paul Huge’s overdub of a Slash solo was one of the factors that caused him to quit. Approach this one with caution then.